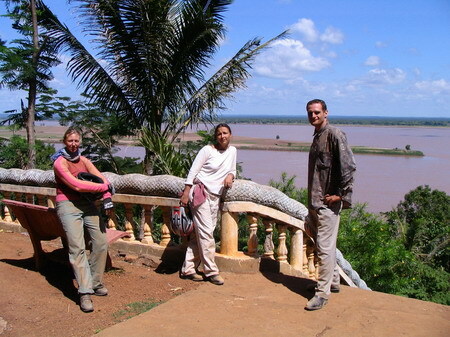 With a week of holidays on the occasion of Cambodia’s Water Festival comes the prospect of a multiple day trip to the northeast, with fellow traveling enthusiasts Katrin, Becky and Toby. 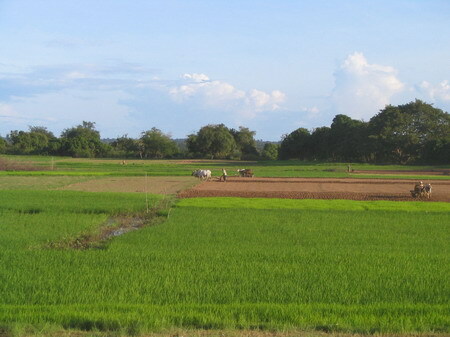 The overall plan is to travel Cambodia’s northeast from Phnom Penh on a loop via Kampong Cham, Kratie, Rattanakiri, Mondulkiri, Kratie, Prey Veng, Neak Luong back to Phnom Penh. Admittedly, details of the route emerge only on the flight. 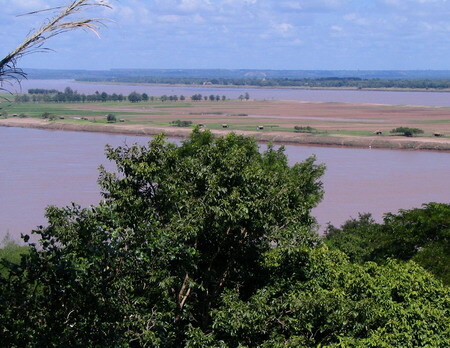 The only given in the plan is the part from Banlung in Rattanakiri to Sen Monorom in Mondulkiri, a stretch of forest, mountains and wilderness which we anticipate to be the most exciting part of the trip. 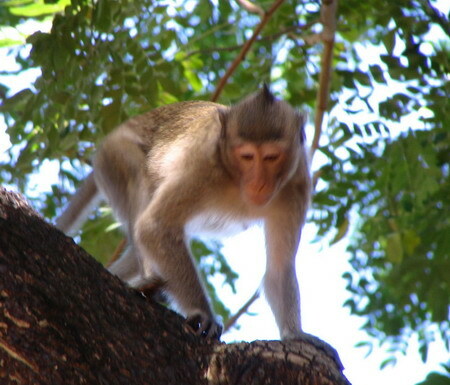 For today we aim only at reaching either Kratie or Stung Treng. We manage to have breakfast reasonably early and fix the bags on the bikes. 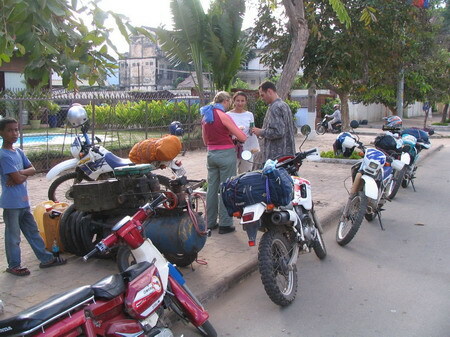 This is when we are about to leave Phnom Penh. 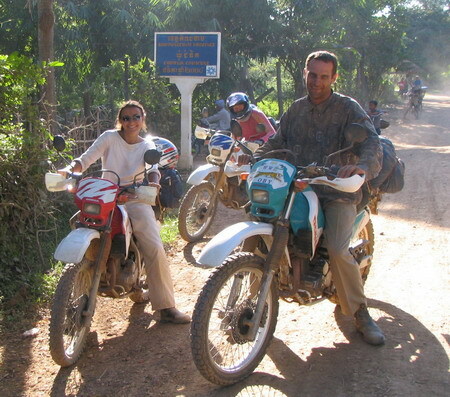 We happen to all ride similar bikes, a model that is fairly useful and common in Cambodia, however not the coolest one around (note that I am not in the photo). That it is the same model helps cutting own on the number of spare parts we carry. This is only two minutes and 50 meters later. 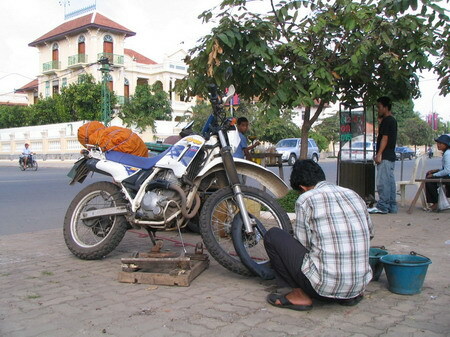 My bike has a flat tyre; luckily right next to one of the countless small businesses in Phnom Penh specialized in solving precisely this problem. We have the first break of our trip. I was the one pushing for planning and for leaving early. 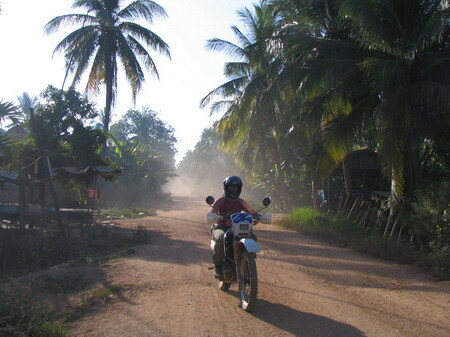 20 minutes later we are leaving Phnom Penh, heading north towards Kampong Cham on National Road 7. Road and traffic conditions are very good. 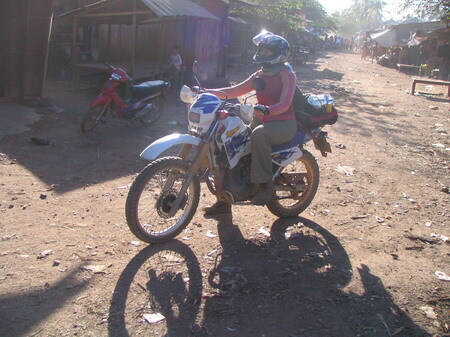 For much of the distance to Kampong Cham we travel a close to the top speed of these bikes, basically without a break. 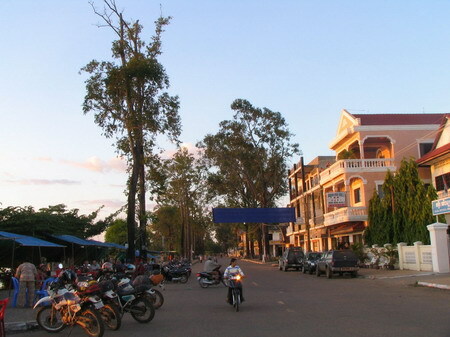 We reach Kampong Cham town and fill up the bikes in the petrol station at the roundabout at the Japanese Bridge over the Mekong River. 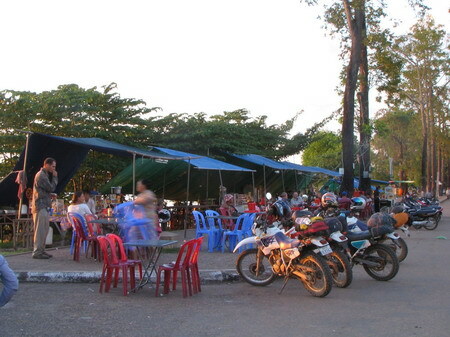 From here we ride the few hundred meters to the Mekong Crossing Restaurant. That place is run by Joe, an American expat who is running the restaurant as well as a local school. Joe is also a great source of up-to-date travel information about the area. 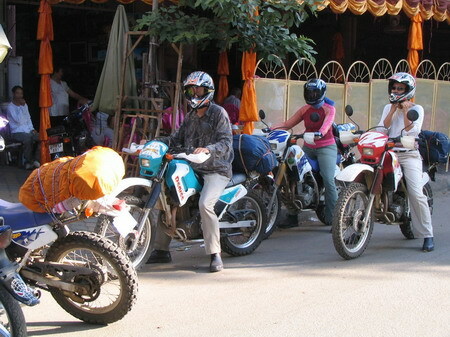 During yet another breakfast we weight with Joe the merits of the three options to get from here to Kratie. I have detailed the options in another post. 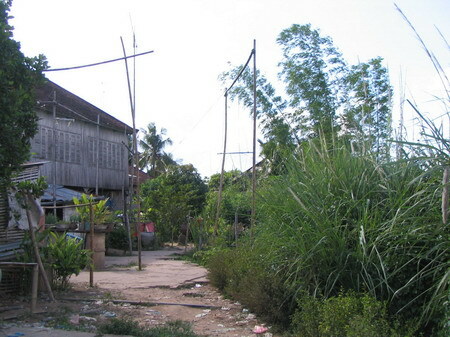 We decide to follow a dirt road from here along the western bank of the Mekong River to Stung Tran (not to be confused with Stung Treng) via Wat Hanchey (Han Chey). 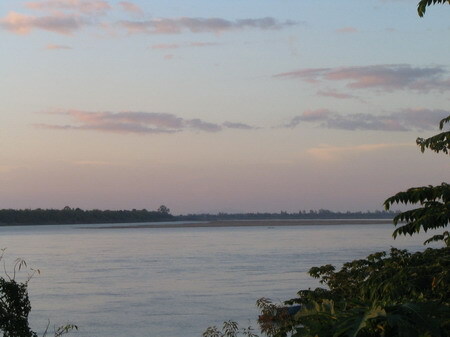 In Stung Tran we want to cross the Mekong with a ferry and proceed on another dirt road along the eastern bank of the Mekong to Kratie via Chhlong (Chloung). 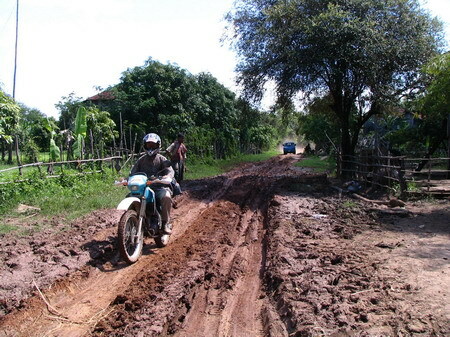 We are delighted to find that the dirt road from Kampong Cham to Wat Hanchey (Road 223) has been upgraded after the last rainy season. I have been riding this road only a few months ago when it had many potholes. Now the road is perfectly even, allowing for a relaxed ride and full appreciation of the beautiful, fertile landscape with charming riverside villages along the way. The ride to Hanchey is a matter of only about half an hour. 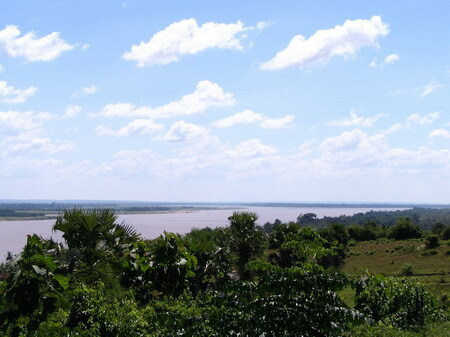 We reach the mountain, ride up to its top, park the bikes and take in the idyllic atmosphere and enjoy the breathtaking views over the Mighty Mekong River. Last time around I looked in vain for this ancient temple, which is, however, hard to miss. 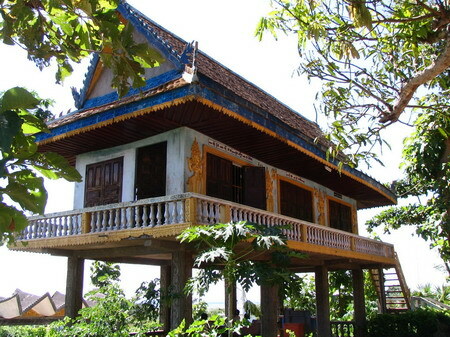 The temple is located right hand a few dozen meters from the road were one reaches the plateau on top of the mountain. 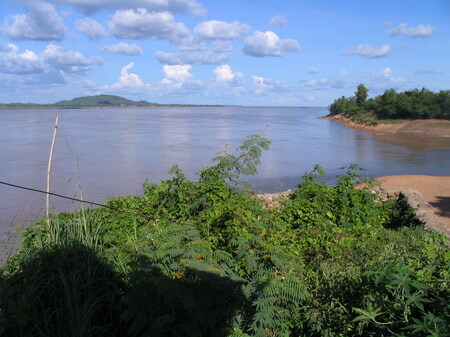 The mountain is located next to the Mekong and close to a major bend in the river with a island right in front of it. 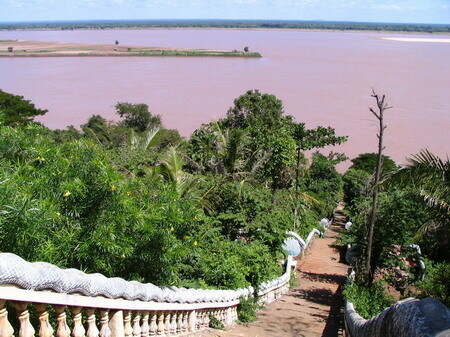 These features, among others, make Hanchey the best viewpoint over the Mekong in Cambodia as far as my opinion is concerned. 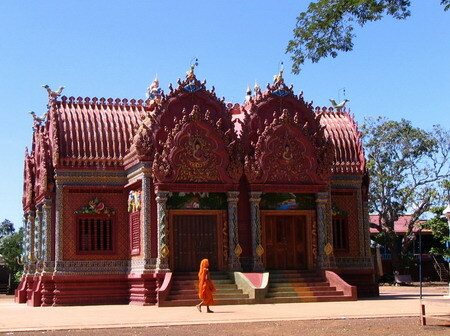 There are a number of religious buildings and monuments all over the plateau along the hill top. Walking along the verge of the plateau we come across this remarkable billboard. 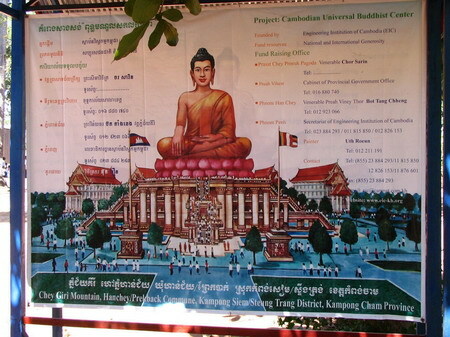 It informs the visitor about the “Cambodian Universal Buddhist Center” project, which, according to the painting, involves the construction of a massive, multistory building with a sitting Buddha measuring dozens of meters on top of it, in the middle of an Olympic-stadium-sized square and flanked by two more multistory buildings. The projected site for this monstrosity appears to be that very mountain. 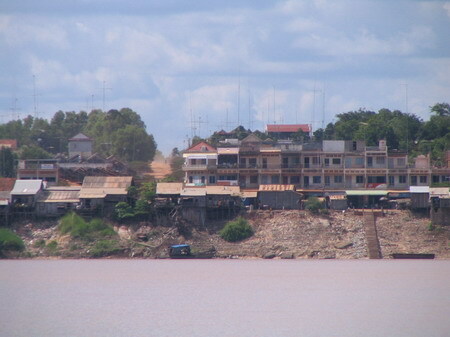 The bottom of the signboard reads: “Chey Giri Mountain, Hanchey/Prekback Commune, Kampong Siem/Steung Trang District, Kampong Cham Province”. A closer look offers relief: “Fund resources: National and International Generosity”. 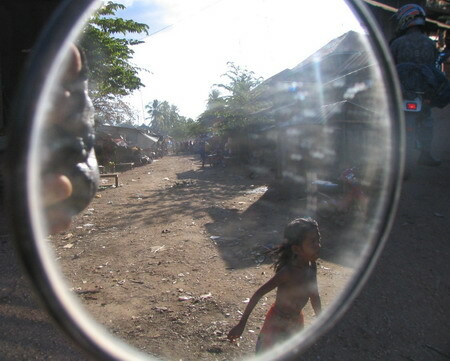 Being aware of a wide range of bizarre excesses of donor activities in Cambodia I still doubt that such a project will attract the kind of funding its realization would require. Other than the painter’s phone number the signboard contains only references to 4 different ‘Fund Raising Offices’ in Phnom Penh, Preah Vihear (! 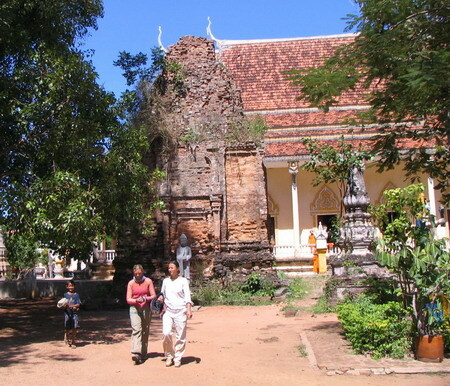 ), Phnom Hanchey and at Prasat Chey Proeuk Pagoda (not sure where that is and there is no phone number). Finally there is also an internet address that appears invalid: www.cic-kh.org. 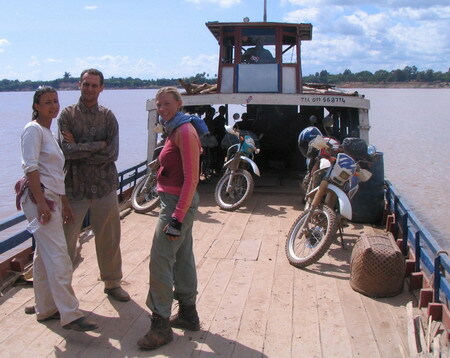 From left to right: Becky, Katrin and Toby. 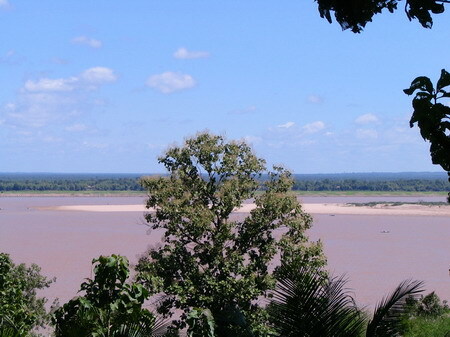 We spend some time walking around and then ride down the northern side of the mountain and proceed on the road along the western bank of the Mekong to the north, towards Stung Tran, which is about 10-15km from here. 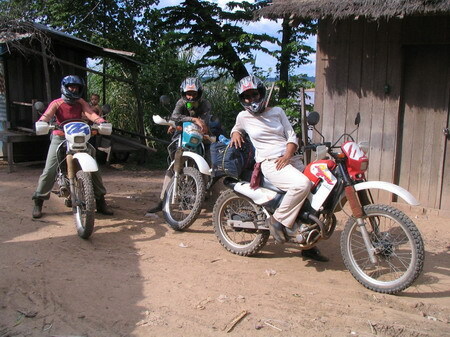 In strong contrast to stretch of road to Hanchey we are now riding a very bumpy and in places fairly muddy dirt road. 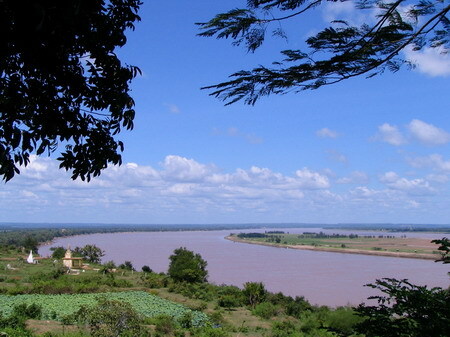 Traveling from Kampong Cham to Kratie along this route is certainly more appealing than the alternative route National Road 7 via Snuol, due not least to the charming character of villages along the Mekong. 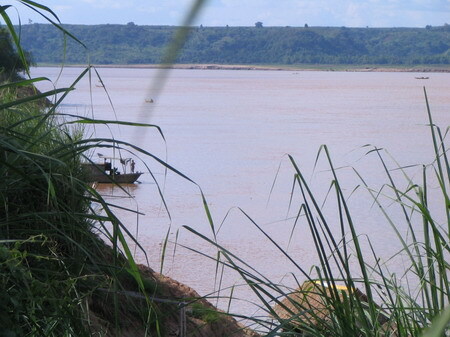 We watch out for a ferry and reach this spot where some boats are waiting at the bottom of what is an extremely steep river bank. Luckily, this is not the ferry place. 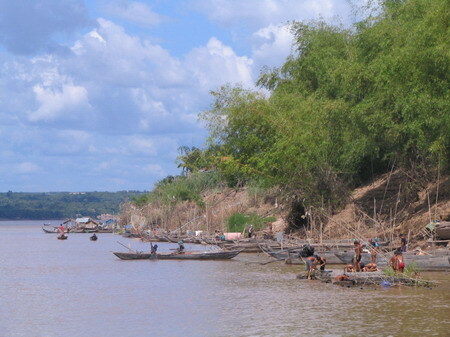 After a few more kilometers we reach Stung Tran where we easily find the ferry place. The people operating the ferry are some laid back fellows hanging out in hammocks in the backside of the boat. At a rather high price of $2 each they take us to the other bank. 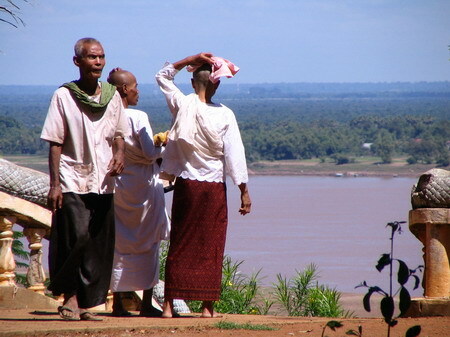 We reach the eastern bank of the Mekong River. We get off the ferry, pass a small settlement and from here follow what is called Provincial Road 308 in the map to the north. 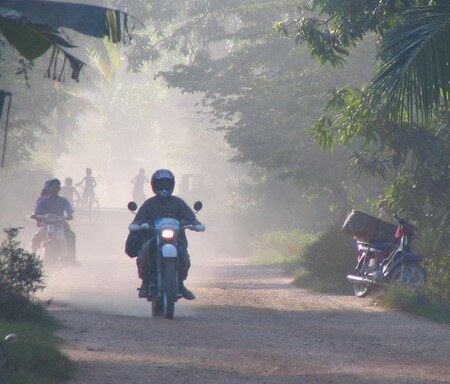 This road leads to Kratie through Chhlong, all the way along the Mekong River, which makes it very easy not to get lost. 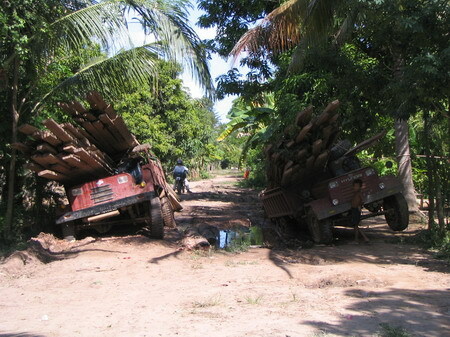 The condition of the road varies widely: some stretches allow higher speed with little interruption whereas other places require slowing down and following narrow paths around obstacles on the road. After maybe 2 hours of riding we reach this gorgeous village where we attempt to find lunch. We find a restaurant next to the river. Khmer lunch time is already over but some meals are still available, among them yummy fish cake and pork. We enjoy an extended lunch break including conversation with locals and some coffee. 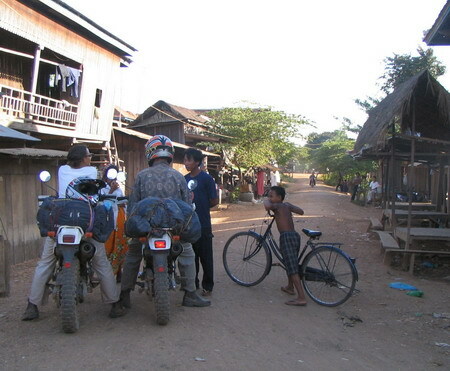 Toby to restaurant owner: How many kilometers to arrive in Kratie? Restaurant owner: You will arrive by 5pm. Toby: How many hours from here to there? Restaurant owner: What time is it now? What makes it even more funny is that she turned out to be right: It is 5pm sharp when we reach Kratie’s riverfront. 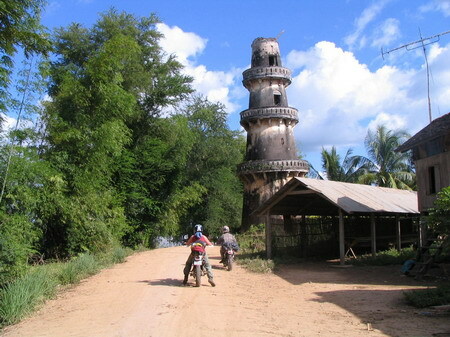 Tower at the Mekong River. I suppose this was built under the French in order to exercise control over traffic on the River. Short break for talking to locals and taking in the beauty of the scenery, and for having some water. This guy is an English teacher at a local school and speaks English very well. 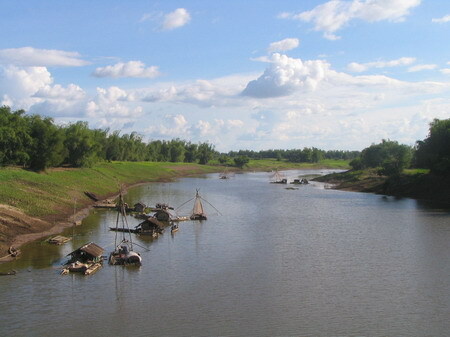 This is a river we cross a few kilometers before we reach Chhlong. 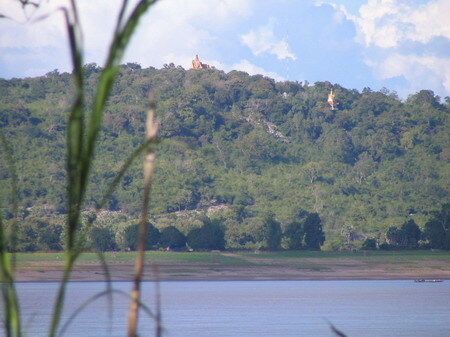 Hill with temple on top of it, on the other bank of the Mekong. 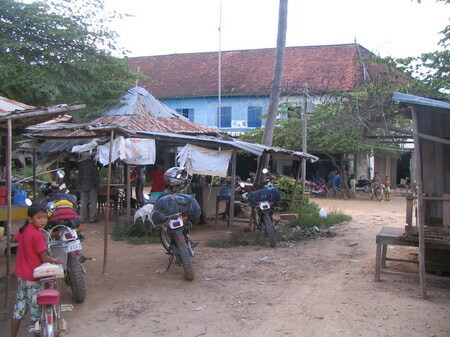 The sign in the background says ‘Chumnik Commune, Kampong Cham Province’. 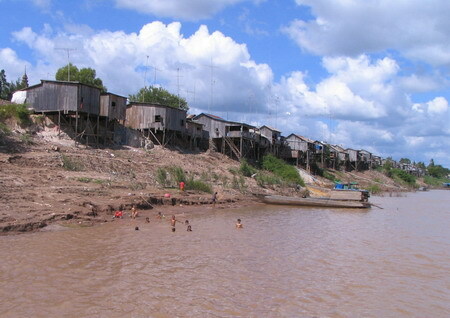 This place is about 15-20km south of Chhlong. 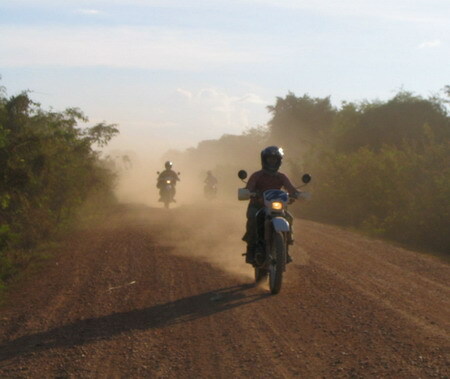 The road around here is still unpaved yet in fairly good condition. This is shortly before we reach Chhlong. 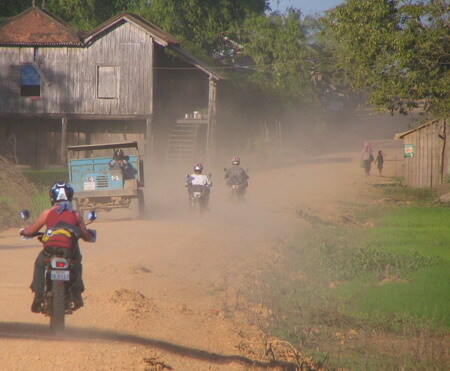 The place can be recognized easily as it is the only, and fairly short, stretch of paved road on this route from Kampong Cham to Kratie. 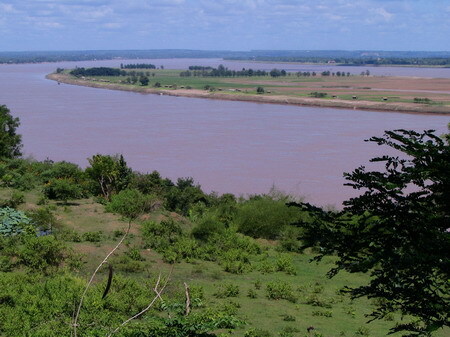 I traveled on this road between Chhlong and Kratie only a few months ago when most of the road was submerged by the flooded Mekong. 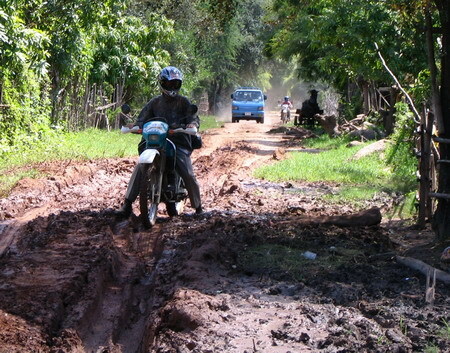 Knowing what the road looked like back then leads me to anticipate this road in distinctively bad condition. 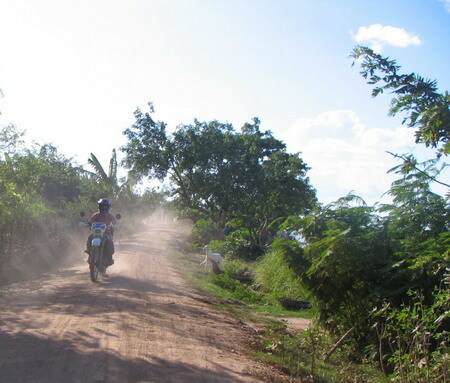 Contrary to this expectation, the dirt road has been fixed and evened out recently and makes for a smooth ride. 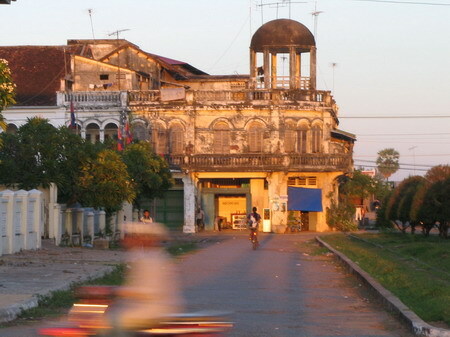 We reach Kratie town at 5pm and check in the Heng Heng Hotel right at the riverfront. Next thing is we have a seat at one of the stalls along the river, dusty as we are, and order these yummy fruit shakes that they sell here. Later we have diner and go to bed. 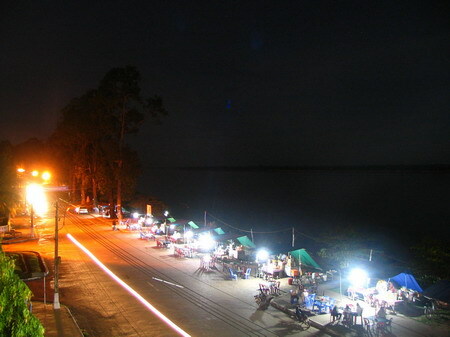 Kratie Riverfront in the evening. 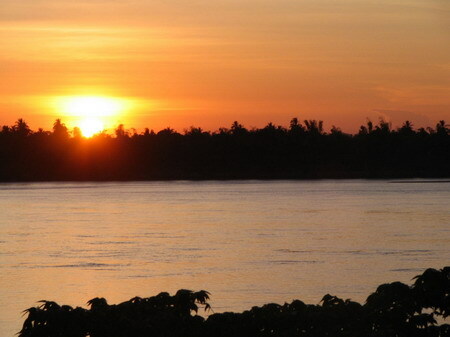 I am very happy to see your newly posted photos with the magnificent sceneries of the mighty Mekong River,especially the one”sun set in Mekong” and the street scenery in Kratie which also arouse me many memories of my childhood in Chhlong . 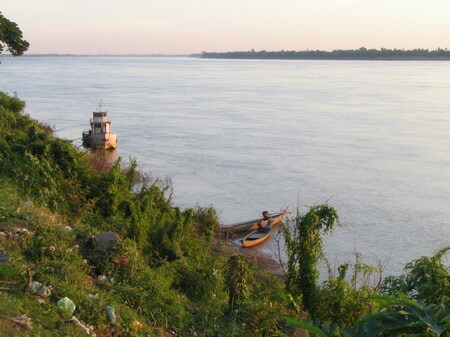 I remember one day a ship owner to whom I called him uncle who had given me a promenade on the river from Chhlong to Kratie and return immediately in the evening and I had the whole steam ship named”Ming Seng” for me only!Oh,it was so great,I wil nerver forget that! I will write you later .With my best regards. Just found your blog — wow — excellent work and a great read. Already planning a few new trips as a result. Kratie is one of my favourite places to relax for a long weekend in Cambodia, when Phnom Penh gets just a little to much like hard work. You were in a great time for adventure journey! 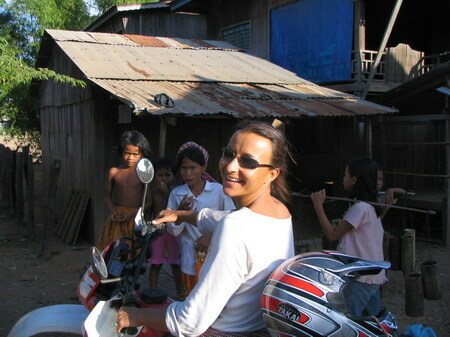 I just came back for my Update-Trip in Feb in order to observe the real situation and accessibility to all remote provinces of Cambodia, I found that in 2008 the governor constructed paved road well from Phnom Penh and well from Kampong Cham to Kratie and Stung Treng (Still not yet from Stung Treng by Rattankiri). 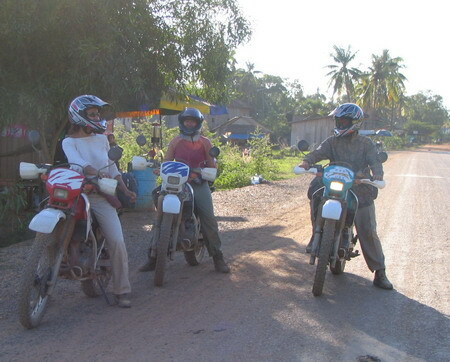 It’s interesting trip with flying motos!